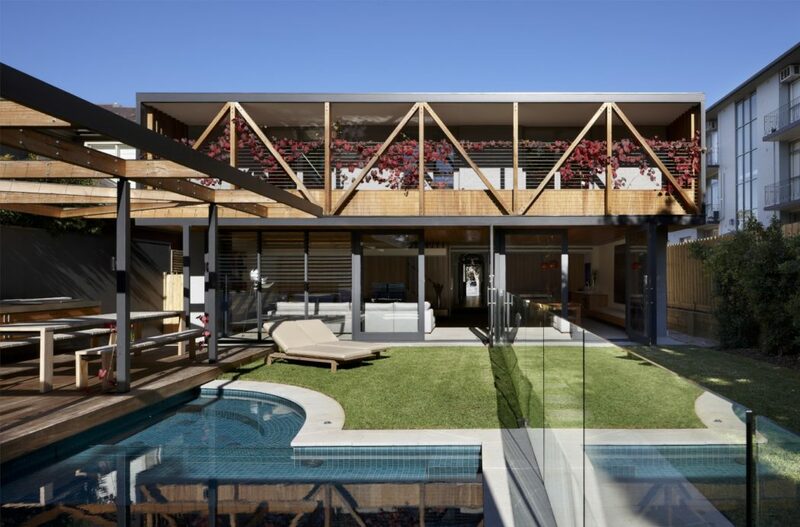 Designed in 2017 by AM Architecture, this inspiring two-story house is located in Melbourne, Australia. A refurbishment and extension of an existing dwelling in a Victorian/Federation transitional style. The starting point was a unique and dignified building which had been left fragmented and incomplete by an unsympathetic extension sometime in the 90?s. What remained was a short lived experience of the original heritage building which bled into a characterless modern extension. The intention was two-fold, firstly to lengthen and consolidate the experience of the original building by extending the formal corridor to a third bay, and restoring the original ceiling height and heritage detail throughout. Secondly to delineate the modern part with a clear threshold and create a new architecture that would transform the existing generic extension and become the soul of the new indoor and outdoor living areas. Once through the formal corridor, the transition into the modern part of the building is marked by a ?ood of light and the openness of a new kitchen/ dining/ living area. The kitchen begins as a white marble slab sitting on a heavy timber table and holds the gas cook-top. The dining table continues unbroken from beneath the marble into the dining area, running for approximately 7.5 metres, and creating an elegant formality. This replaces the gesture of the formal dining table seating a generous 15 people.